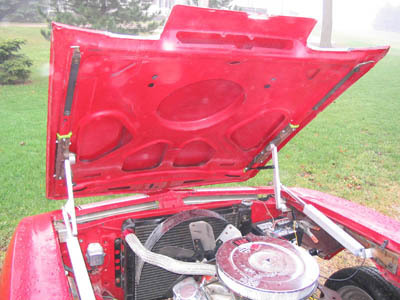 This powered hood kit opens the hood up and forward, controlled with a remote key fob. Please click here for more information! 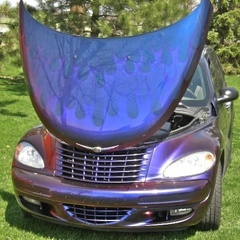 This kit for the PT Cruiser includes every part needed to reverse the hood opening. Please click here for more information! The above are pictures of our style two hood hinges, in open and closed positions. Style 2 has worked well with kit car bodies, and may work with any light fiberglass or carbon fiber body panel. Street Dreams By Ross, L.L.C.TM multi-link hinges are designed to move the part up from the body before rotating, preventing damage to either and easing installation. The parts are made of aluminum, with steel and stainless steel hardware. These hinges includes gas shocks not shown for ease of photography. This product is the same as the Style 2, with all the dimensions being 1.5 times larger. The above are pictures of our style two hood hinges, in open and closed positions. 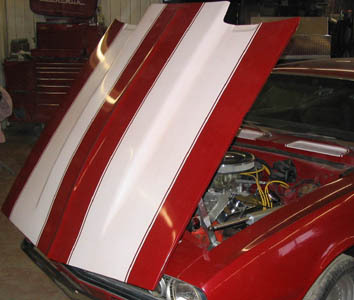 Style 2 has worked well with kit car bodies, and may work with any light fiberglass or carbon fiber body panel. Street Dreams By Ross, L.L.C.TM multi-link hinges are designed to move the part up from the body before rotating, preventing damage to either and easing installation. The parts are made of aluminum, with steel and stainless steel hardware. These hinges includes gas shocks not shown for ease of photography.